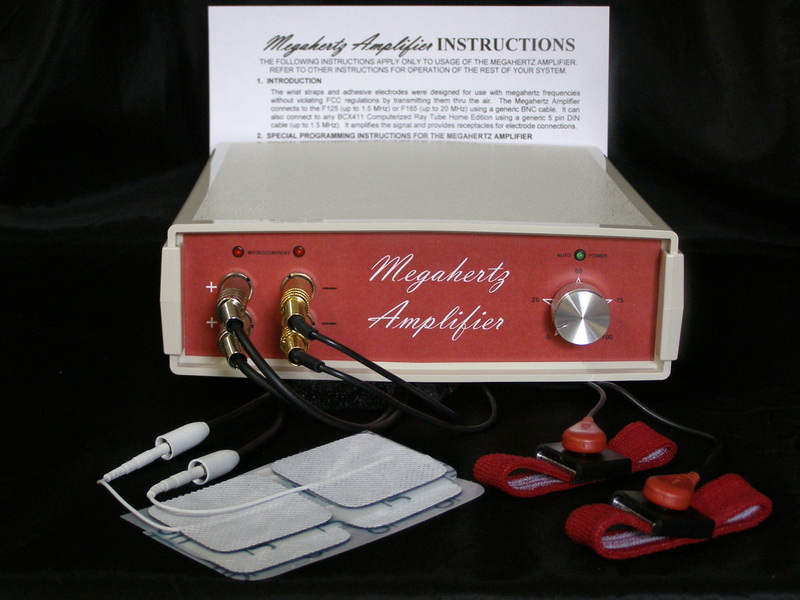 The Megahertz Micro-current System is the best way to get started with frequency technology without a large investment and it’s also the most portable 20 MHz system. It delivers the full frequency range and can be expanded by adding a netbook computer and BCX411 with plasma tubes to build the complete 20 MHz Convertible Ray Tube. It consists of the Megahertz Amplifier, F165, 2 wrist straps and 4 adhesive electrodes that were designed for use with megahertz frequencies without violating FCC regulations. · Runs all Dr. Hulda Clark frequencies (200 KHz to 600 KHz). · Runs all the German frequencies from Royal Rife Digital that go up to 1 megahertz at http://www.rifedigital.com/php2/CAFL2010.pdf. · Runs 11.43 MHz and 11.78 MHz, used by Dr. Rife for Cancer at the Mayo Clinic. · Delivers over 100 times the micro-current energy of plasma tubes. · Blood carries the micro-current everywhere it goes. · LED lights indicate micro-current delivery. · Automatically turns on when the program begins and turns off when it ends. · Add a netbook computer for $400 to increase the programmability and storage capacity. · The Mini Microcurrent System looks identical and performs to 1.5 MHz for $400 less. · Designed by an engineer with a Ph.D. in Natural Medicine and proven to be safe when used as suggested in the instructions. The Megahertz Amplifier connects to the F125 (up to 1.5 MHz) or F165 (up to 20 MHz) using a generic BNC cable. It can also connect to any BCX411 Computerized Ray Tube Home Edition using a 5 pin DIN to BNC cable (up to 1.5 MHz for models 6.0 thru 7.4 and 20 MHz for models 7.5 and later). It amplifies the signal and provides receptacles for electrode connections. It comes with 2 wrist straps and 4 adhesive electrodes that were designed for use with megahertz frequencies without violating FCC regulations by transmitting thru the air. · ﻿ Delivers over 100 times the micro-current energy of plasma tubes. · Can be used with plasma tubes simultaneously for a truly powerful experience. · Shortens session times up to 80% compared to plasma tubes alone. · Can be used with the F125 or F165 key pad generators for portability. · The Photon Probe Pro plugs into the back for wound healing and improving eyesight. · Runs 11.43 MHz & 11.78 MHz, Dr. Rife used to eliminate Cancer at the Mayo Clinic.